Stock markets do not keep going up and up. History has shown that stock markets go up most of the time, but when corrections occur, share prices go down, sometimes dramatically. This is as inevitable as the seasons of the year and just as necessary. We are able to predict the changes in seasons with a fair degree of accuracy but no-one has ever been able to consistently predict when market corrections will take place. According to well-known investor and fund manager Peter Lynch, far more money has been lost by investors trying to anticipate corrections in the market than in the corrections themselves. A sensible investment strategy is to invest in a diversified portfolio of funds which incorporates asset classes such as equities, bonds, cash, and property. When one asset class experiences a correction, the performance of the portfolio is often boosted by good performance in another area. Most investment portfolios should have a healthy exposure to shares or equities and you should always allow this component of the investment enough time to outperform inflation. Equities have always outperformed all other asset classes over meaningful periods of time. Instead of trying to time the market, you should rather spend more time in the market. 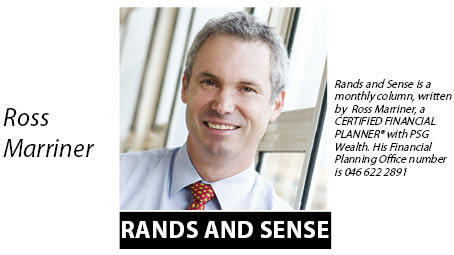 Rands and Sense is a monthly column, written by Ross Marriner, a CERTIFIED FINANCIAL PLANNER® with PSG Wealth.